angrily read at the audience, without eye contact, rat-a-tat-tat, a statement attacking opponents of her PASSPORT LABS, INC. parking app scheme, mocking people for "misinformation"
I asked for any legal research supporting her ukase on applause, addressing it to the St. Augustine Beach City Police Chief City Attorney, Florida Bar, Florida Police Lawyers Association, city insurance defense lawyer. I asked to talk to Mayor GEORGE about her bad excuse for performance art, as if channeling the ghosts of Richard Milhous Nixon, Captain Queeg from the Caine Mutiny, and Col. Nathan Jessup from A Few Good Men. In the immortal words of William F. Buckley, Jr., "Why does baloney reject the grinder?" Perhaps psychiatry or a walk on the beach might help this joyless juvenile St. Augustine Beach Mayor UNDINE GEORGE. 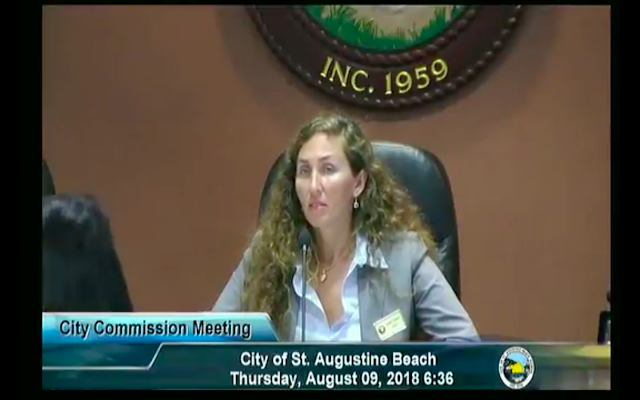 St. Augustine Beach Mayor UNDINE GEORGE is already drawing comparisons to her petty, mean, vindictive predecessor, disgraced, defeated ex-Mayor ANDREA SAMUELS, and raging redneck boor disgraced former St. Augustine City Manager WILLIAM BARRY HARRIS. I rated UNDINE GEORGE our "Worst Mayor" in Folio Weekly superlatives last week. She reminds me of the narrow-minded joyless city officials in the movie, "Footloose." wondrous reported experience with the glories of smartphone app parking in a courthouse garage in Gainesville. Police officers have a legal duty to disobey illegal orders, like those that Mayor GEORGE would like to give to remove people engaging in First Amendment protected activity. Police officers will not indulge the delusions of this juvenile judgmental Mayor, whose hare-brained smartphone parking app scheme is in flames. The next time Mayor UNDINE GEORGE makes an illegal order, as she did to citizens Tom Reynolds and Merrill Roland eleven months ago, Chief Robert Hardwick is now on notice that he is duty-bound to refuse it, or risk being sued for civil rights violations for violating the First Amendment. Please call me to discuss your irascible behavior at the January 8, 2019 St. Augustine Beach City Commission meeting. Dear Mayor George, Mr. Wilson, Ms. Erdelyi, Ms. Raddatz, Mr. Royle, Chief Hardwick, Ms. Gleason, Mr. Hawkes, et al. 1. Please send me any First, Ninth, Fourteenth Amendment, F.S. 286, Florida Constitution Article I, Section 24 or other legal research or Attorney General opinions on whether the Mayor of St. Augustine Beach, a licensed attorney, may selectively gavel and bark at people and threaten to remove American citizens from a public City Commission meeting (not a quasi-judicial hearing) in retaliation for non-disruptive free speech, e.g., merely applauding or laughing -- while appearing on other meeting videos leading applause and laughter herself, ex officio as Mayor. 2. If no such legal research exists, please ask the Florida Bar, Florida Police Lawyers Association, Florida State Attorney General, St. Augustine Beach City Attorney and insurance defense counsel for their research or opinions. 5. Please send me any League of Cities or law review articles, or case studies or research, on the historic outcomes for elected officials who abuse their authority, including those who stigmatize and mischaracterize human applause and laughter as "outbursts," or who otherwise seek to stigmatize protected activity as "disruptive," including the journalistic, electoral, civil, criminal, Florida Bar, administrative and psychiatric response(s) or sequelae. Please free to call me to discuss.